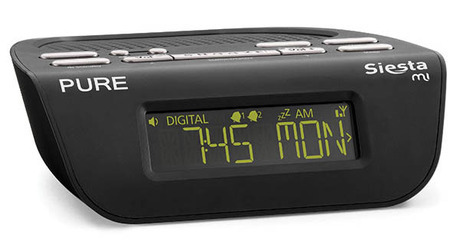 Ah good – a digital radio for *under £40*. Digital radios are great (who knew there was a BBC Radio 7??) but they are expensive so it’s good to see PURE putting out an affordable one as well as their more advanced £100 offerings. The Siesta Mi is PURE’s cheapest bedside digital radio, it’s a slimmed down version of the Siesta which they describe as a “the UK’s bestselling digital bedside radio”, an honour indeed. The features include the alarm – which can turn on with either digital radio, FM or a tone; a large clear display for the time and what it promises to be punchy radio. Late-sleepers will be pleased to know it has a snooze function. As a bedside radio it gets its power from being plugged in to the mains, so won’t take batteries and you can’t walk around with it.. Still, if you’re looking for an digital radio that won’t break the bank on you.. check this one out. Radio: Digital and FM. UK products receive DAB/FM; non-UK products receive DAB/DAB+/FM. Speaker: 1W RMS Full-range 2.5″ drive unit. Controls: Power on/standby, volume +/-, snooze, menu, Source, sleep, two quick-set alarms, preset, tune/select, select +/-. Connectors: 5V Mini USB power adaptor socket (also for software updates). Presets: 8 digital radio and 8 FM presets. Power: 100-240V AC to 5V (800 mA) DC Mini USB external power adapter.